"Invest in quality products whilst helping save water and improving the quality of life at the same time." Scandinavian Water Saving Products was started with the idea of offering superior water saving products that drastically reduce the amount of water people use without losing out on their lifestyle. Its products don’t just help save water but they also allow one to keep and even improve their quality of life. Scandinavian Water Saving Products was born and now represent Wostman, Nebia in South Africa. The company supplies three super water-saving products that combine technology, innovation, beauty and sustainability. They are imported from the USA and from Sweden and are of top quality. At this year’s show the company will be showcasing the Nebia Spa Shower, Altered: Nozzle and the Eco Flush alongside other products which it offers. The Nebia Spa Shower is known as the company’s most luxurious import and has been designed to give a unique experience with steam and mist whilst at the same time washing and hydrating the body. The nozzles deliver millions of micro droplets, instead of streams of water, saving thousands of litres of water a year (at least 70% compared to a normal shower head). 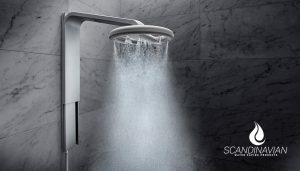 The shower has been endorsed by Tim Cook from Apple and is installed at the Apple Campus in California. The Altered: Nozzle is designed and manufactured in Sweden and was recently shortlisted in WWF Climate Solver 2018. Made from solid brass, it fits most taps and can be installed easily. There are two modes available, one of which will save 98% of the water used previously but with the same effect. The third product is a functional, smart toilet, Eco Flush, originally designed in Sweden with septic tanks in mind, in other words, water savings was always part of the product design. It works like a normal WC except that you can choose to flush just 300ml or 4,5 litres depending on what is needed. Smart technology for water conscious consumers. 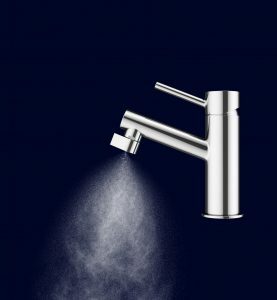 “At Scandinavian Water Saving Products, we’re passionate about finding top quality extreme water-saving products for homes, restaurants, gyms and hotels that will outlive any water restrictions and that will give us back our lifestyle and comfort, whilst being sustainable and beautiful”, says Antonella. What’s life without water??? Invest in quality products whilst helping save water and improving the quality of life at the same time. The company is looking forward to showcasing and talking more about how to save water in the long term whilst at the same time maintaining a lifestyle. See Scandinavian at Hall 3 stand no. P72 from 24 -26 June 2018 at Gallagher Convention Centre.